What is it about shows from the spring of 1977 that get Dead Heads’ hearts a-fluttering and mouths salivating? There arguments are those who firmly believe that it is the Best Dead Tour Ever. Maybe, maybe not. These arguments are so subjective. But the sheer number of archival releases that have come from that tour--all of them outstanding--would seem to corroborate the notion that The Powers That Be understand what the fuss is all about. So, what was happening in the band at that time that made them rise to such peaks of greatness? Lots, actually. The second half of 1976 marked the Dead’s to return to touring following and 18-month hiatus during which they recorded one studio album (Blues For Allah) and a slew of solo projects, but performed just four times in San Francisco at special events. Mickey Hart had been reintegrated into the group following his own five-year hiatus from the Dead, and the group’s repertoire was awash with new material and revived Dead classics. Towards the end of ’76, the Dead decided they’d had enough of running their own record companies and signed a deal with former Columbia Records boss Clive Davis’ young label, Arista Records. Clive, bless him, truly believed the Dead could/should make a hit album, and his enthusiasm was infectious. So much so that he talked the Dead into making their first Arista album with a mainstream producer--Keith Olsen, who was suddenly red-hot after helming a best seller for the resurgent Fleetwood Mac. During the first months of ’77, the Dead spent much of their time working with Olsen in his L.A.-area studio recording Terrapin Station (released at the end of July ’77). Olsen proved to be quite a taskmaster in the studio, demanding take after take of their new songs, which included future classes “Estimated Prophet” and the “Terrapin” suite, plus “Passenger,” Donna Godchaux’s moving “Sunrise,” and a pair of cover tunes that had come into their repertoire when the haitus ended, “Samson And Delilah” and thir controversial disco arrangement of “Dancing In the Street.” Olsen worked long hours with the drummers forcing them to, in a sense, orchestrate their parts for the record, and he expected nothing less than perfection from the guitarists--a novel concept in the Grateful Dead. Astonishingly enough, the band didn’t rebel against their producer’s demands but acceded to his desires and in the process became a tighter and more confident band all the way around--which was reflected in their playing when they began their firm major tour of 1977 at the Philadelphia Spectrum during the third week of April. Buoyed by the extremely enthusiastic response to their new original--which besides the aforementioned songs also included the magical Mickey Hart-Robert Hunter tune “Fire On The Mountain,” ingeniously paired by Garcia with “Scarlet Begonias”--and playing with a conviction and energy that surpassed all but the very best 1976 shows, the Dead’s 26-date East, South, and Midwest jaunt that spring of ’77 seriously blew minds at every stop. Along the way, too, the band continued the process of reviving songs that had not been played since their “comeback” a year earlier, and also brought in new covers over the course of the tour. In the former category such were tunes as “Me & My Uncle,” “Brokedown Palace,” “Jack Straw,” “Mexicali Blues,” and “China Doll”; in the latter were “Jack-A-Roe” and “Iko-Iko.” The tour took the group to a wide variety of venues, from theaters to college gyms to civic centers to pro basketball/hockey arenas. Though certainly ascending in popularity, the group was still regarded as a fringe hippie group in an era when both punk and disco were grabbing new fans from opposite sides of the musical spectrum. 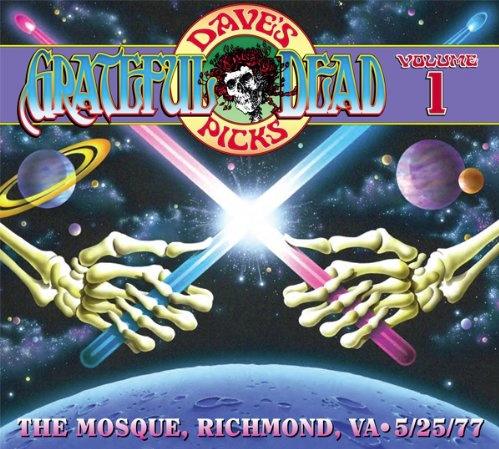 This first release in the Dave’s Picks series features the Dead’s only show at the beautiful Mosque in Richmond, Virginia, on May 25, 1977--near the end of the spring tour and the sixth of seven below the Mason-Dixon line (making this the group’s longest tour of the South to that point). The band had played Virginia a few times since their first appearance at an odd venue in Virginia Beach called The Dome on 5/11/68: a pair at the College of William & Mary in Williamsburg (9/11-12/73) that included the short-lived two-man horn section of Joe Ellis and Martin Fierro on a few songs of each show; one at the Roanoke Civic Center (7/27/74--love that “Eyes Of The World” encore! ); and another winner at William & Mary 9/24/76. But the Mosque was special--one of many amazingly ornate and exotic multiuse theaters (movies, stage productions, other events) that sprang up in the late 20’s, before the Depression effectively put an end to such extravagant designs. Like the opulent Fox Theatre in Atlanta (where the Dead played six nights earlier), The Mosque was originally built as a “temple” by the Ancient Arabic Order of the nobles of the Mystic Shrine--better known as the Shriners, a service organization of fez-wearing men who donate time and money for numerous charities, particularly those involving children, and also are known to party hearty (and drive miniature cars in civic parades). The Shriners’ majestic Virginia headquarters--the ACCA Temple Shrine, which opened in October 1927 on the corner of Laurel and Main streets in Richmond--was a five-story brick Moorish Revival structure with two elaborate minaret towers rising high on each side of the auditorium entrance, and small domes above each of the enormous building’s four corners. In addition to the huge theater (capacity around 3,700), the building also had many offices, meeting rooms, and Egyptian Revival ballroom, and a large indoor swimming pool. The theater itself was a hodgepodge of Islamic-influenced design elements, including five intricate murals above the proscenium arch, more in the lobby and hall areas, stencils of Saracenic geometric patters throughout, and a spectacular dome dominated by gold and aluminum leaf and colorful ornamental tiles imported from Italy, Spain, and Tunisia. By the time the Dead played there in ’77, The Mosque had hosted literally thousands of events. During the ‘30s, the Ziegfeld Follies, the first “talkies,” George Gershwin, and the Russian composer Rachmaninoff entertained crowds there. In the ‘40s (after the city of Richmond bought the building from the Shriners), the Tommy Dorsey Orchestra fronted by Frank Sinatra, and all sorts of legitimate theater productions and big films packed the place. Hank William played there in 1952, and in ’55 and ’56 Elvis Presley played The Mosque five times (usually as a support act for popular country stars). In October ’57, a touring rock ‘n’ roll cavalcade brought in Fats Domino, Chuck Berry, Buddy Holly, The Everly Brothers, The Drifters, and more. The late ‘60s saw appearances by such act as Buffalo Springfield, Jimi Hendrix, Canned Heat, The Who, and The Supremes. And in the first half of the ‘70s The Mosque hosted Bruce Springsteen twice, Genesis, Kiss, and many other top acts. The second set is a true wonder, however. The “Scarlet" > "Fire” is unquestionably one of the best of the 14 played on the tour. The “Estimated” and “He’s Gone” are perfectly rendered and the latter leads to a cool short jam before Mickey and Bill take over for their percussion assault--it must have been something hearing the massive drum hits bouncing off the walls around the theater and pinging off the illuminated dome above. Those of you who are into song list minutia will be excited to learn that the long, variegated post-”Drums” sequence of “The Other One” > “Wharf Rat” > “The Other One” is the only time those tunes were presented in that way. After that show highlight, the lovely “Wheel” that follows floats through the hall like an extended grace note, before the slam-bang double-shot Chuck Barry ending and encore gets the crowd hot and sweaty one last time. What a show! Sounds like he got it. You will, too. This album was released in January 2012.